Other than Professional Liability claims, Auto Liability claims are the largest exposure faced by Architecture and Engineering firms. If your design firm is small to mid-sized, often “a standard BOP (Business Owner’s Policy) is sufficient to meet your property and casualty coverage needs. A BOP combines the basic coverage requirements a small to medium sized business owner would need in a package.” Those insurance companies that understand the specialized needs of design firms sometimes combine certain coverage enhancements within their standard BOP. These enhancements can include extended coverage for architectural models, a waiver of subrogation (as is often required by project Owners during contract negotiations), and even some limited Auto Liabilty coverage. 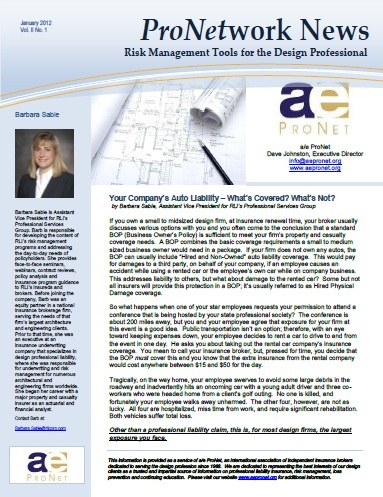 Our latest ProNetwork Newsletter, Your Company’s Auto Liability – What’s Covered? What’s Not?, focuses on the necessity of this coverage. A coverage which, if both architect/engineer and broker aren’t careful, can be overlooked at renewal time. What does Hired Physical Damage cover? And why/when would you need this coverage? Your star employees requests permission to attend a conference hosted by your state professional society. The conference is about 200 miles away. Public transportation isn’t an option; therefore, with an eye toward keeping expenses down, your employee decides to rent a car to drive to and from the event in one day. He asks you about taking out the rental car company’s insurance coverage. You mean to call your insurance broker, but, pressed for time, you decide that the BOP must cover this and you know that the extra insurance from the rental company would cost anywhere between $15 and $50 for the day. Tragically, on the way home, your employee swerves to avoid some large debris in the roadway and inadvertently hits an oncoming car with a young adult driver and three co-workers who were headed home from a client’s golf outing. No one is killed, and fortunately your employee walks away unharmed. The other four, however, are not as lucky. All four are hospitalized, miss time from work, and require significant rehabilitation. Both vehicles suffer total loss. To read about the outcome of this “doomsday scenario,” and to understand how Hired Physical Damage coverage can help, download the full PDF version of our newsletter here. About the Author: Barbara Sable is Assistant Vice President for RLI’s Professional Services Group. She is responsible for developing the content of RLI’s risk management programs and addressing the day-to-day needs of policyholders. 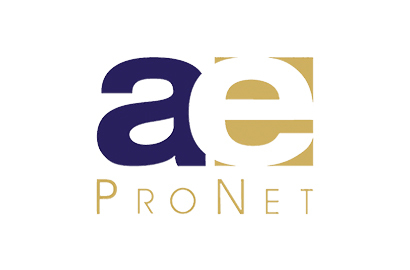 RLI is an a/e ProNet Platinum Sponsor. The Design Professional in the Age of BIM: Things that change; things that don’t. Cleaning House: Our New Homepage!